All tricks and no treats made Jack a stingy pumpkin man! FrenchDistrict > New York > French District Confidential > Test your knowledge…remember the gh’oul times! Test your knowledge…remember the gh’oul times! My mirror showed a naked fool! Te(st)rrifying – Did you know? 1. Why the Celts began wearing masks and costumes during Halloween? 2. According to a belief, people born on Halloween day have which particular talent? They can see and talk to spirits. 3. What country celebrates day of the dead, from midnight on October 31st? 4. What vegetables did the Celts initially used to carve the jack-o-lanterns? 5. According to the belief, what does it mean when you see a spider on Halloween day? A close deceased person is watching over you. 6. According to legend, what must a girl do on Halloween night if she wishes to see or dream of her future husband? She must bring a flashlight to a water source, look at the reflection in the water, put a twig of Rosemary and a penny under her pillow and plant a seed of hemp. 7. According to a legend of Halloween, what should you do if you want to see a witch? Wear your clothes backwards and walk backwards. 8. It is believed that on Halloween night birds try to feed on the souls of the dying humans dying; how to protect yourselves? Turn your pockets inside out and let them hang. 9. 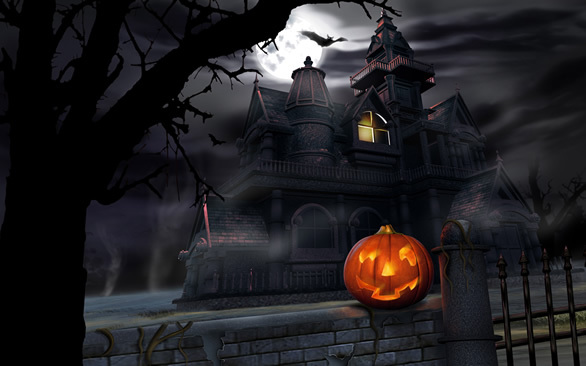 What pagan holiday did Halloween originate from? 10. Some people think that during Halloween, ghosts and other evil creatures roam the surface of the Earth; how to protect yourselves? Bury animal bones in the garden. Celtic religious festival, Samhain celebrated among the Irish and the Scots marks the passage through the dark period of the year all the 1st November. The Roman Catholic Church turned this ceremony in Halloween around the 8th century, which celebrates ‘all saints’, (in French, la Toussaint) and which two centuries later came to be followed as the day of the dead. Halloween, “All Hallow’s Evening”, or literally “the eve of the day of all Saints’, was imported to the United States in the middle of the 19th century, especially after the great Irish Famine between 1845 and 1851 which forced thousands of Irish to go into exile. Today, Halloween is a party amongst friends and family, where the main activity is to dress up and claim sweets from the neighbors by chanting “trick or treat?”. An innocent party or a party with secrets embroiled it it? In the Celtic times, fairies were thought to run free on the Eve of Samhain. They weren’t necessarily evil, but not particularly good either. They were mischievous. They liked to reward good deeds and did not like to be crossed. On Samhain, they were thought to disguise themselves as beggars and go door to door asking for handouts. Those who gave them food were rewarded. Those who did not were subjected to something unpleasant. In medieval times, one popular All Souls’ Day practice was to make “soul cakes,” simple bread desserts with a currant topping. In a custom called “souling,” children would go door-to-door begging for the cakes, much like modern trick-or-treaters. For every cake a child collected, he or she would have to say a prayer for the dead relatives of the person who gave the cake. A very popular character in Irish folk tales was Stingy Jack, a famous cheapskate who, on several occasions, avoided losing his soul to the devil by tricking him (often on All Hallows’ Eve). Much like the American stories of the devil. In one story, he convinced Satan to climb up a tree for some apples, and then cut crosses all around the trunk so the devil couldn’t climb down. The devil promised to leave Jack alone forever, if he would only let him out of the tree. When Jack eventually died, he was turned away from Heaven, due to his life of sin. But, in keeping with their agreement, the Devil wouldn’t take Jack, either. He was cursed to travel forever as a spirit in limbo. As Jack left the gates of Hell, the Devil threw him a hot ember to light the way in the dark. Jack placed the ember in a hollowed-out turnip, and wandered off into the world. According to the Irish legend, you might see Jack’s spirit on All Hallows’ Eve, still carrying his turnip lantern through the darkness.